It is feared that the virus may spread to other states as well. Alerted by the rising toll in Kerala, the Goa health department has asked all hospitals to remain alert. The deadly Nipah virus has claimed 11 lives in Kozhikode and Malappuram districts in north Kerala so far. According to reports, the condition of one of the patients undergoing treatment is critical. Two patients, Rajan and Ashokan, who were undergoing treatment in a Kozhikode hospital, died on Tuesday morning. The health department has confirmed that the two had contracted the virus. According to reports, the World Health Organization (WHO) has been informed about the outbreak of the virus in Kerala. A nursing assistant, Lini Puthussery, who died on Monday, had also contracted the virus. Lini, who worked at Perambra Taluk Hospital, was one of the three nurses who had fallen sick and were showing symptoms of the highly contagious disease. On 16 May, she went to work and joined duty at 6 pm. She reportedly developed a fever that night. Suspecting that she was infected by the Nipah virus, she was reportedly confined to an isolated ward before her death. Meanwhile, of the 18 samples sent for testing, 12 have tested positive for the virus. Of these 22 patients, 10 have died. On 20 May, two patients Sindhu and Sijitha, who were from Malappuram, died. The two had come to the Kozhikode Medical College Hospital for treatment and had been in touch with one of the infected persons who had died of the virus. No fresh case has been reported so far. Chief Minister of Kerala, Pinarayi Vijayan on Twitter wrote that the people interested in volunteering to work in Nipah affected area must contact the director of Health Dept. or the Superintendent of the Government Medical College, Kozhikode. Health Minister K K Shyalaja said on Tuesday Union Health Minister, J P Nadda, who is in Geneva, had called her and enquired about the situation in the state. She said the minister promised all help from the central government. An expert team from the National Centre for Disease -Control (NCDC), including its director, Dr Sujeet Kumar Singh and Head of Epidemiology, Dr S K Jain, is already in Kerala. “A high level team from AIMS has also reached the state,” she said. A team headed by Director NCDC reached the spot today and another one consisting of doctors from AIIMS and RML shall be landing tomorrow. GoI is fully committed to extending all support to the state govt. Random checks are also being conducted on people coming to the state from Kerala. 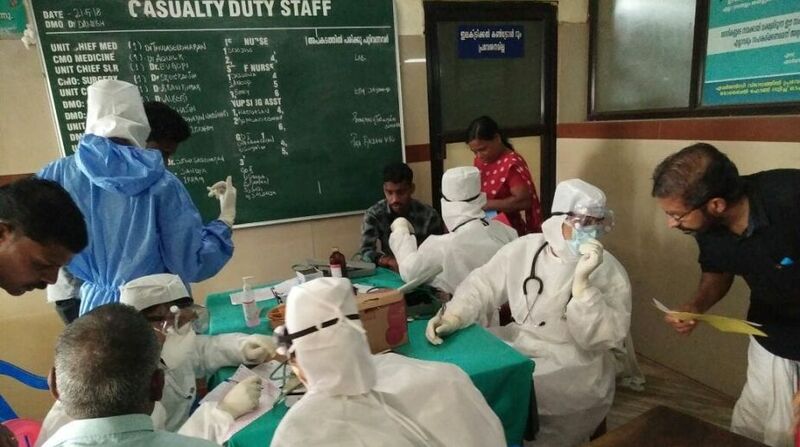 The Tamil Nadu health department has also advised people to take precautions in the wake of Nipah outbreak. People have been advised not to eat raw fruits without washing or peeling. The health department has also advised to avoid contact with infected people.